My Christmas tree tells a story that I know by heart. Every year when I open the boxes marked Christmas, I hesitate before reaching in for the first of many memories that wait wrapped in a protective layer of tissue paper and packing. Each ornament documents a chapter or a page from the book that is my life and it is difficult and bittersweet sometimes to remember where I was in life when certain ornaments found their way to my Christmas tree. Every year for as long as I can remember, my step-mom Cullene has given me a special ornament. She began this tradition with my dad and continued it after he died in 1990, only a few weeks before Christmas. When I was home for Thanksgiving, she gave me my latest one. Can you guess which one came back with me in my carry on bag? If you need a hint, she wanted to remind me of my American home as if I could ever forget the people I love there, simply because there is one I love here now too. My daughter Miranda’s tiny fingerprints grace an ornament she made as a gift when she was two and there is a green glass globe to the right with her name written in red glitter that we made together when she was seven. If you look in the top right hand corner you can see a white crocheted snowflake that has been on Cullene’s tree for years. When my dad was living they filled their tree with them and she invited me to take a few back to the UK. I chose three, one for Miranda, one for John and one for me. You can’t have missed the Palace Guard to the left and below the American flag. I bought it at Buckingham Palace when Miranda and I spent a week in London in the summer of 2003. It’s been on my tree since, waiting, and perhaps maybe even knowing, that it would find its way back home to England one day. I bought a new addition for our tree during a craft sale in the village shop last Saturday. It is the first one I’ve purchased for us since we married earlier this year and I think it is a simple and lovely addition. You can’t see it in this picture but there is a hint in the title above. If you can guess what it might be, I’ll l be back to show it to you later on Christmas Day. It’s late here about 3:15 a.m. on Christmas morning and I must go to bed before the house begins to wake up so …goodnight everyone and Merry Christmas. 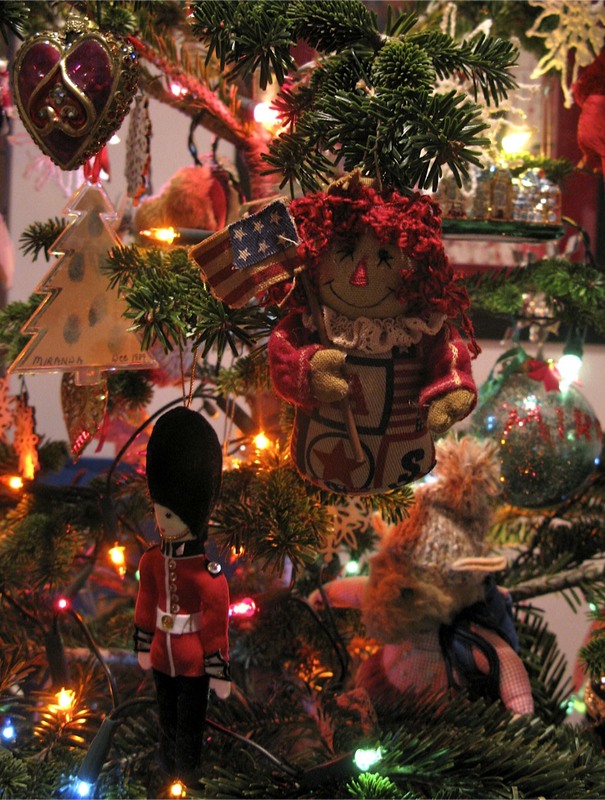 This entry was posted in Family, Living in UK, Love, Memories and tagged America, American Flag, Buckingham Palace, Christmas Tree, Crochet, Gifts Of The Journey, London, Ornament. Bookmark the permalink. It is lovely to have stories attached to your Christmas ornaments. Especially when you are living away from home. My parents in Ireland send a Christmas decoration to each of my three kids every year. Celebrating Christmas in Australia is a strange concept. Heat and sunscreen, I say no more! I hope you have a wonderful Christmas. I have really enjoyed reading your blog over the last few months and look forward to seeing lots more of your lovely photos in 2010! Merry Christmas to you also! Your tree is gorgeous and reflects your roots and your journey. No wonder you hold it so dear and in so much respect. I have been reading your blog for a while, and also think your pictures are truly wonderful. I have especially enjoyed your new life in Cornwall. My (American) parents have put down roots there, (I am elsewhere in the UK) and its a wonderful place. I too am about to leave corporate life, with a good deal of trepidation, so its very, very good to see others who have done this and who are thriving on it. Looking forward to seeing more and to posting a blog of my own as part of my new adventures in 2010. Thank you for setting such an excellent example, and for sharing your journey which has been truly helpful to me. Big hug to you and all yours. It’s great that your tree has so many memories attached to it, love the American one she’s very sweet. Hope you had a lovely day. What a beautiful post. I feel the same way about my Christmas tree. Try as I might to want to put out a “Decorative tree”- I can’t not hang up my “hearts and memories” Thanks for sharing and Happiest of Holidays to you and your family!